Here's the scene: I was running about a mile from my home and boom, I was out in the country. (This was a few years ago. Now I have to run further out to get to the country.) I noticed in the left ditch there was a huge dead cow. Now I've come across this before and I will mercifully not elaborate. I just went on by minding my own business. I ran about 5-6 minutes past this scene. As I ran on I did notice that the deceased bovine (aren't you impressed?) was lying in state under a rather large tree. Upon my turn around to head home, the tree could not be ignored. 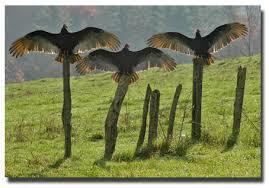 It was filled with these soon-to-be preying buzzards! The scene was very much like the picture on the left above. I counted about 30 of them as I passed underneath them. 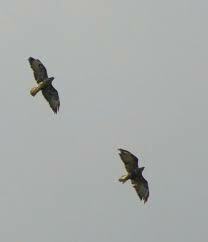 Now buzzards such as in the middle pic, are a fairly common site in middle TN. When you have a long way to go and you are tired of running, they are a great incentive to keep moving. Yet this tree had some low branches and I had to go right through them. They were huge! There was no other way to get home, other than the long way around – like 10.5 miles around. That wasn't going to happen that day. Not knowing how buzzards respond to runners who come close to their "merchandise", I chose to be proactive, as I do with dogs. With dogs, I usually speak first, just to let them know I see them and that I am not afraid of them. Although this was an entirely different species, of course, I chose to take the same approach. So I let out an "I'm not afraid of you" yell. Basically just a loud, but low-toned "hoop!" and several quick claps. Then my heart almost stopped. All 30 buzzards immediately flew from the tree and began circling around me and the dead cow. It was exciting and terrifying, for a moment, and then it was over. I ran under the flying flock and made sure they stayed air-born until I passed their animal of interest. And that was it. Not necessarily eventful, thank the Lord, but you gotta admit, that's an animal combination that you don't see every day. There will probably be more posts on running as I'm getting back into it, hopefully for the Country Music Half Marathon this April and beyond. But if you want to review details of my animals encounters (and who wouldn't?) just check out the archives section under the "Running" catagory. Dad, that is stinking hilarious! I never knew about the cow and buzzards story! Wow. This is exactly why I refuse to run by myself outdoors! I love you!